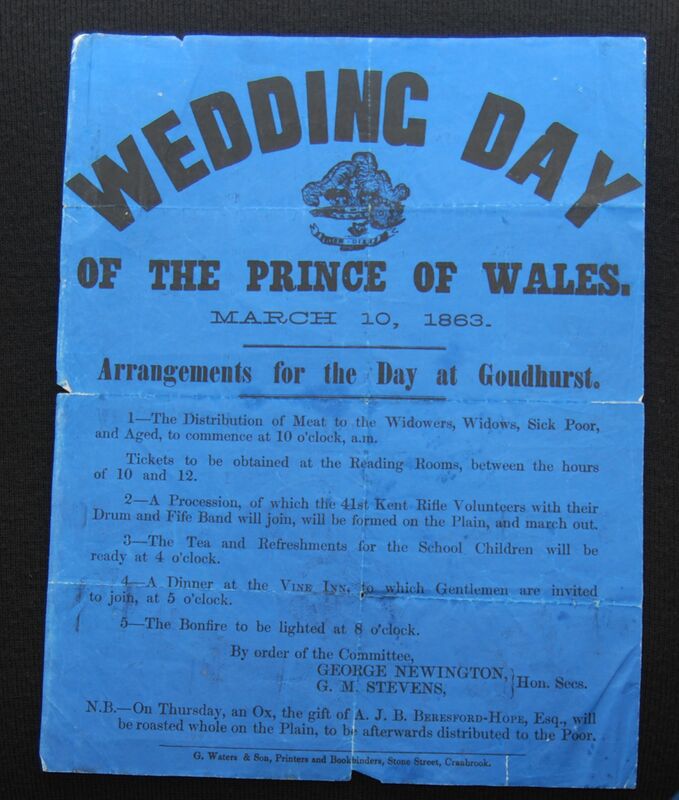 Prince Albert Edward, Prince of Wales and, and Princess Alexandra of Denmark were married in St George’s Chapel Windsor on Tuesday 10th March 1863. The Prince was 21 and Alexandra was 18. Prince Albert Edward had wanted the wedding to be a grand state occasion like previous royal marriages, but his mother, Queen Victoria, disagreed. The Queen, still in mourning after the death of her husband 15 months earlier, insisted that it be a “public” not a “state” occasion. The venue was criticised in the press because it was not in London and was small so public crowds would not be able to see the spectacle. Maybe Victoria had underestimated the Nation’s affection for the young princess. Alexandra arrived at Gravesend aboard the Royal Yatch Victoria and Albert on Saturday March 7th. Thousands had turned out in the town to welcome her and a flotilla of boats sailed alongside the Royal Yatch as it came up the Thames. When she arrived in London the streets were lined with thousands more people wanting to catch a glimpse of the Prince’s bride to be. 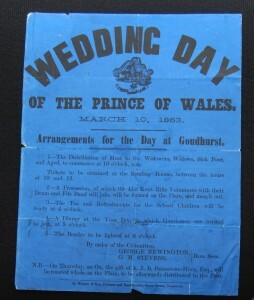 On the day of the wedding there were celebrations throughout the land. As always on these occasions, in Goudhurst a special committee had been elected to oversee the event. The committee had produced a poster detailing the proposed arrangements . The day began when the bells of St Mary’s Church rang out early in the morning. Then, at 10 ‘o’clock, the distribution of meat and bread to the widowers, widows, sick, poor and aged of the village began. Anyone who was entitled to some food was asked to collect a ticket from the Reading Rooms between 10.00am and midday. This concluded at around 1 pm. At 2 ‘o’clock the Rifle Corps mustered at the Plain. Then, at 2.15 pm, they marched through the village to Five Fields led by their Fife and Drum Band and followed by a procession which included the committee, school children and many villagers all carrying their flags and banners. The Rifles fired three volleys while at the field and then the procession marched back to the Plain where a “feu de joie” was fired. A “large booth” had been erected on the Plain in readiness for use on the day. At 4 ‘o’clock the school children sat down to tea and refreshments in the booth. At 5 ‘o’clock members of the organising committee and their friends, sat down to dinner at the Vine Inn. Then, at 8 ‘o’clock, the bonfire at Five Fields was lit. There had been plans to plant two trees, brought from Bedgebury, to commemorate the occasion, but this did not go ahead because of the bad weather. On the following Thursday an ox, provided by A.J.B. Beresford Hope Esq., was spit roasted on the Plain by the local blacksmith James Bearsby. A big crowd had turned out to watch despite the rain that had started to fall mid morning. The ox weighed 85 stone and took until 3 ‘o’clock to cook. Once cooked, it was hoisted onto a platform in the booth and six members of the Committee set about carving it up for distribution to the waiting crowd. Hundreds of labourers and their wives, dined on the meat that day. Any meat that was not needed on the day was used to make soup which was distributed to villagers on Saturday and some more on the following Wednesday.